When you’re looking for the smallest gas chainsaws it can get very difficult to label just one. Since smallest can have many different meanings. For example, some people are looking for bars that are under 14 inches, or an overall compact unit, while others are looking for a gas chainsaw that doesn’t weigh a lot. Then there is also the engine to think about which can be smaller as well. When you think about all those together you can see why so many people get overwhelmed, when searching for one. So I thought I would put this buyers guide together with some of the best small gas chainsaws on the market. 1.1 The Small Engine, But Powerful? 4.2 But How Tough Is It, Really…? There are a lot of advantages to smaller chainsaws that make them extremely valuable tools in your work shed. Having a big 20 inch chainsaw is great if you have to handle some big tasks, but it isn’t going to help when you need to use it in a enclosed space. This is where chainsaws that have 14 inch and under bars come into play, and with a gas engine will make them more powerful and versatile. So a smaller bar is something to look for when you’re looking for a small gas unit. While the obvious advantage of a gas chainsaw is that you don’t need to charge a battery or need some heavy duty extension leads to operate it. This is a big advantage of these types of units, which is why it’s important to be a lightweight chainsaw, and not weigh 20 lbs. Not weighing a lot is almost a necessity with most chainsaws, considering how long you will be using these tools.But for smaller and more compact models, how heavy they are really counts. The Small Engine, But Powerful? The most important part of a chainsaw is its engine, this is what will do the work and make short work of the things you need to cut. So having a powerful engine is great but it can weigh the unit down, and you may not need the big 60cc engine. And spending the extra money on all the power you won’t use, can be a burden on anybodies wallets. In my opinion the best small gas chainsaws have engines that are between 32cc to 45cc, this seems to be the best range in terms of power to cost ratio. With all that in mind read on below to find out my reviews for the smallest gas chainsaws, that won’t break the bank. 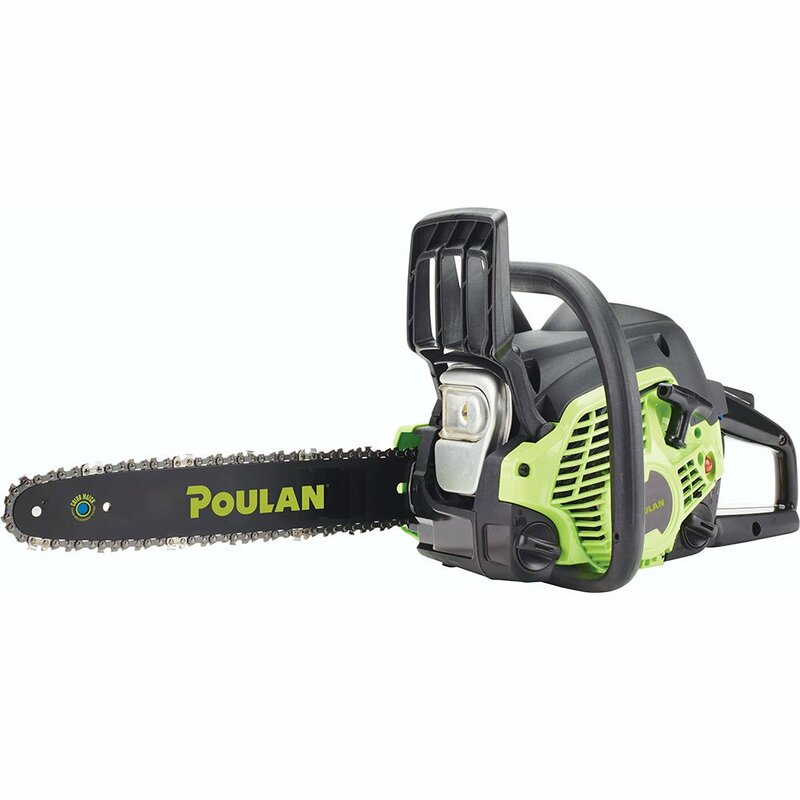 This Poulan 14 inch chainsaw is a very impressive small chainsaw which has very few pitfalls. Considering how tiny it is, it is powered by a 33cc 2 stroke engine, which gives it a decent amount of power. 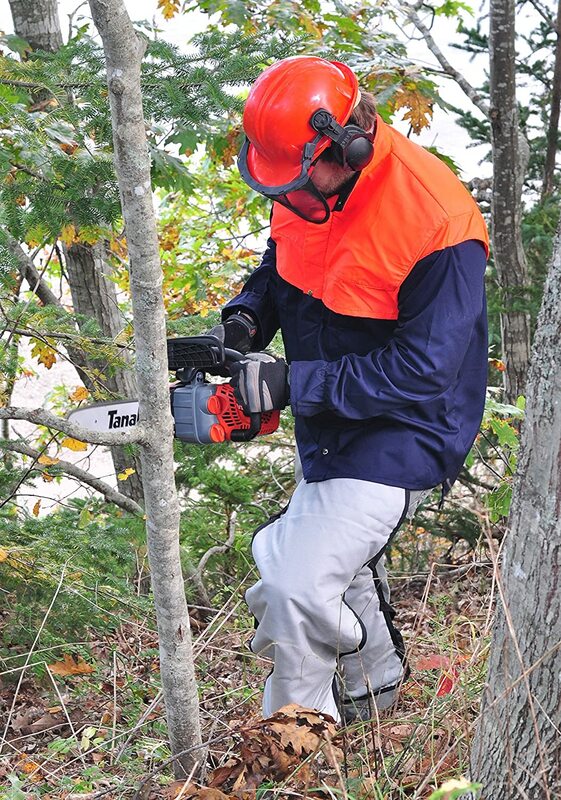 It is a great chainsaw for getting through medium sized trees, and it excels at the smaller jobs, such as removing limbs from trees and the odd pruning. The largest tree that this chainsaw can get through is about 12 inches in diameter, which I find to be quite impressive. But if you’re looking to go a bit larger then I would recommend one of the units below. One thing I have noticed with this chainsaw is that a lot of people have trouble starting it. This is pretty common for Poulan brand chainsaws, they do have a pretty complicated way to start there units. As long as you follow the instructions on pumping the bulb and using the choke, you really shouldn’t have an issue. I would recommend after using this chainsaw is to run it dry which will help prevent some of the nasty fuel problems you can get, when you put your chainsaw away for awhile. It does weigh a bit more then I would like coming in at about 17 lbs, but after extended periods of use it never felt to heavy. And with its 14 inch bar you won’t be cutting for very long with this unit, so you shouldn’t get the arm tiredness as easily if you’re a first timer with a chainsaw. While it does take a bit of effort to start this chainsaw, I found once it had started it was very reliable and ran very smoothly. After a few uses, the starting motion becomes second nature anyways. Being able to make short work of anything below 12 inches in diameter is very useful for yard tidying, and removing some medium sized trees. Some chainsaws can be really thirsty to the point it feels it costs you more to run the chainsaw, then it would cost you to get a tree removed professionally. However, I found this chainsaw to be very economical without sacrificing power. Remington did a lot right with this chainsaw, being one of the more powerful small chainsaws on the market. This is thanks to its 42 cc 2 stroke engine, which provides a lot of power. It’s a very reliable engine that starts very easy, which is something my shoulder was thankful for. This chainsaw was easily able to get through tree limbs, and medium sized trees like they were butter. Tho once you started to move into the larger more hardwood trees this unit started to be able to handle it. But it will still get through the average home owners work load without and drama. One thing I really liked about this chainsaw was just how well it was constructed, so much so that I don’t think the average person will notice. Remington went the extra mile on the inside of this chainsaw. A lot of chainsaws have a fair bit of plastic on the inside which can cause some problems when it comes to heating. This chainsaw on the other hand has a lot of metal inside that are anchored in the right places. But it is its metal crankcase which I appreciate the most in this chainsaw, since this will prevent melting the muffler if it ever gets loose. It is just so well designed on the inside that I had to recommend it. There are just 2 things I don’t like so much about the Remington Rebel Chainsaw. With one of them mainly being nit picky. That is the anti vibration system isn’t as smooth as some of the units I have used, which isn’t a big issue but thought I should mention it. The only other issue I have had with this chainsaw, is that it does leak chain oil when stored. Which isn’t a really a deal breaker to me since a lot of units do this, but again I had to mention it. This chainsaw starts really easy, especially on a cold start which is an important thing for myself and a lot of others. I don’t know how many times the cold start has brought down a lot of good chainsaws. The 42cc 2 stroke engine is such a great engine, that I can’t really fault it. It has plenty of power and extremely reliable considering its a small chainsaw. The construction of this unit is just incredible, and I am grateful that Remington went as far as they did on the inside. It was this incredible construction that makes it so reliable and durable. This chainsaw does have the option to come with larger bars, so while this buyers guide is for small gas chainsaws. I do like that this chainsaw gives you options if you want to go larger. It weighs roughly 15.7 lbs so it weighs less then the Poulan above, so if weight is a concern for you this is a good choice. Tanaka have made a name for themselves as being a quality chainsaw manufacturer, and this really shows with this 12″ model. There is one thing I need to mention first if you’re thinking this is the chainsaw for you, and that is Tanaka can be expensive units. So if you’re on a budget it might be better to look at the units above. But if you’re a chainsaw aficionado you will appreciate what they have done with this compact chainsaw. Especially the 32.2cc 2 stroke commercial engine that is attached to this unit. This is a really solid engine that is very fuel efficient thanks to Tanaka’s Pure Fire engine. It has less moving parts inside meaning less fuel, and less can go wrong. But How Tough Is It, Really…? This is a surprisingly heavy duty chainsaw that really feels like it was made for more commercial work, especially thanks to its top handle use. Which makes it easier to use this unit one handed, which is something that professionals look for with their chainsaws. Which if you’re going to operate a chainsaw one handed, you need a top handle chainsaw. Tho it goes without saying you should be careful when operating a chainsaw with one hand, considering how dangerous chainsaws can be. The thing I didn’t expect with this chainsaw was just what it could cut, which is why it costs more then the other units on this list. It can easily handle the small tasks like delimbing trees, and removing small trees. But it was able to cut down some red oaks that were 20 inches in diameter, which is impressive. I know red oak isn’t the hardest oak to cut, but for a chainsaw with a 12 inch bar it is impressive. The engine on this chainsaw is very impressive to me, I was genuinely surprised with how much power it had. I didn’t think to much about the top handle of this unit, until I started to use it one handed. It was just so well balanced and felt as comfortable as operating it two handed. It only weighs about 11.9 lbs so it isn’t a heavy chainsaw, which is great especially if you’re operating it one handed. The less weight the better as far as I’m concerned. It can come with either a 12 inch or 14 inch bar, which are both small bars. While personally I like the 12 inch bar, the ability to go a size up is very useful. Most people who have ever dealt with wood know the brand Husqvarna. Whom have made a solid reputation for making great products. Which is very obvious when it comes to this chainsaw, which is made for cutting. 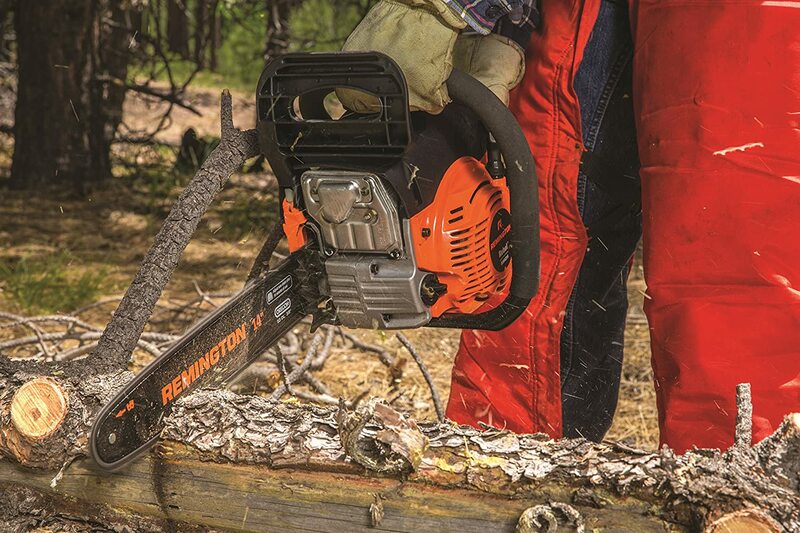 This is a powerful chainsaw thanks to its 38.22cc engine. It’s a very solid engine that I found has only but one issue. One of the things I have seen again and again with this chainsaw is that it is hard to start, which I can’t deny. It is difficult to start, but once it does it works like a dream. It idles great and sounds right at high revs cuttings through some solid 14 inch in diameter pine trees. One thing that really stood out with this chainsaw to me was its lack of vibration feedback. When operating this chainsaw at high revs, you could still feel the vibration of course, but it didn’t feel to bad that is was making my hands go numb. Which is a nice quality of life improvement. But when you mix the low amount of vibration and the weight of this chainsaw being 10.3 lbs, makes this a very pleasant experience when using it. It really is a shame the difficulty starting it, as some people may get put off by the issue. Apart from its difficulty in starting there isn’t really many downsides to this chainsaw, none that I could find anyways. 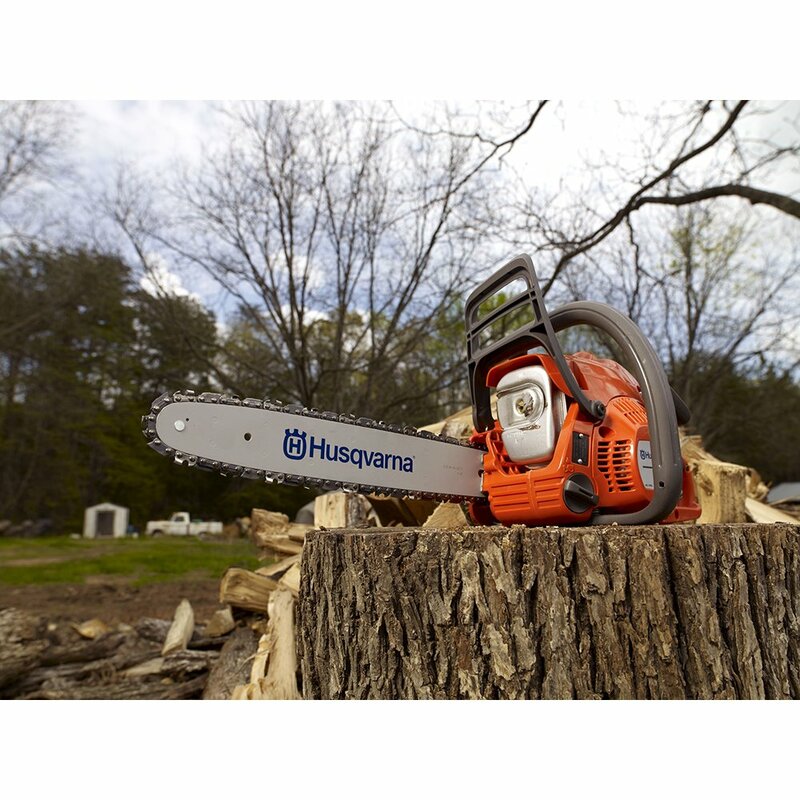 It is the best running chainsaw on this list, which is what you would expect from such a reliable manufacturer like Husqvarna. Being able to get through trees that are 14 inches in diameter isn’t to big of a surprise, since Husqvarana sell this exact model with larger bars. So the engine does have the power to remove some of the larger things, it is the bar which limits how large the objects it can cut are. Which isn’t a downside, it is nice and compact and great for tight spaces. The amount of power this chainsaw has is impressive for its size, which makes it great if you have some more difficult tasks to do. Just remember this isn’t a heavy duty chainsaw so it won’t be able to do the larger more hardened trees. The low vibration system is something that I really like, and really made a difference to user fatigue. Which meant I could use this chainsaw for longer, which meant I could finish quicker. Once I got this chainsaw started it ran exceedingly well, and never skipped a beat. This is the kind of reliability that Husqvarna have earned a reputation for over the years which really shows with this chainsaw. 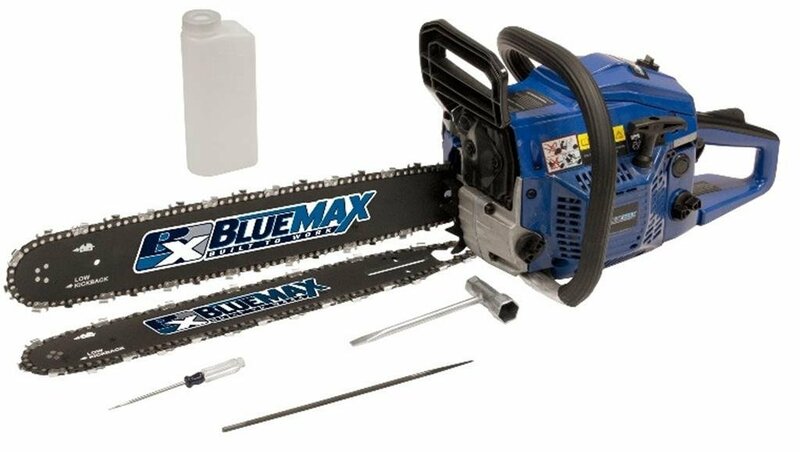 Blue Max weren’t a company that I knew a lot about before reviewing this chainsaw, and I fortunate that I was recommended to try one out. It is a great affordable chainsaw that has some great accessories. The first thing to note with this chainsaw is that it comes with two separate bars, a 14 inch and 20 inch respectively. It’s essentially two chainsaws in one, which is great value for money. There is no need to buy any extra accessories except maybe a case. This will allow you to get through some much larger trees when the occasion rises, and still be able to handle the smaller tasks. It just makes this chainsaw great value for money in my opinion. Given that it has two different size bars gives this chainsaw a lot of versatility, especially with its 45 cc engine. Having such a powerful engine on this chainsaw really makes a difference when it comes to cutting. It can handle those smaller jobs such as pruning, with the small bar. Then it can handle the larger jobs like taking down a massive 70 foot tall tree, and then de-limbing them. This is something that I can’t pass up, being able to do both kinds of jobs really stood out to me. Who doesn’t like having a tool that can do multiple types of jobs. While having that powerful engine and the two types of bars are amazing features. It was how easy this unit was to start is what impressed me the most with it. Compared to some other units that feel like they take 50 pulls to start, this unit almost always started on every second and third pull for me. Which is something that I really appreciate. The biggest hassle with chainsaws is starting them, and this one didn’t have that hassle for me. One thing that I have to mention is that is is very hard to find replacement parts for this chainsaw if you do have any issues. Something I thought I should mention. The multiple bars is something that all chainsaws should come with, no need to go research and find the right bars. It just comes with the chainsaw. The very powerful 45cc engine is the strongest on this list, and it really showed with what it could cut down, easily outperforming everything else on this list. It is the heaviest chainsaw on this list weighing 18.19 lbs, which personally I heavy duty feel this unit gives. Tho if weight is your biggest concern then I would go with one of the units above. 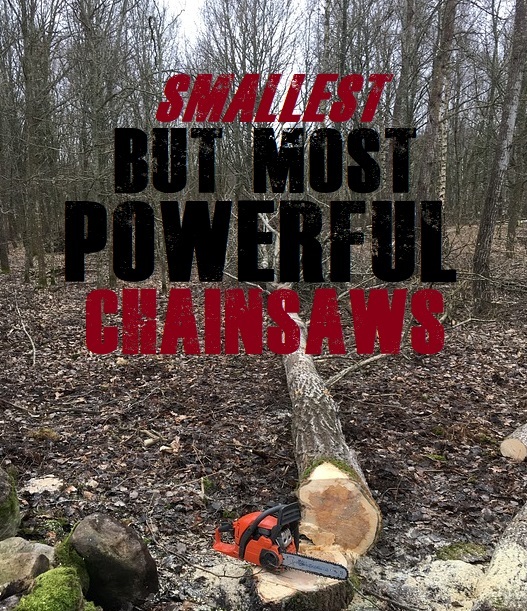 With how much engine technology is developing the power of this smaller chainsaws are getting to the point, that the only thing stopping them from cutting the largest trees down is the bar size. Having such power in small portable machines, that weigh next to nothing in the grand scheme of things. Is extremely useful and should be in everyone’s tool shed who needs to cut some wood, whether it be removing tree limbs, cutting a tree down, or cutting logs into fire wood. I fully stand behind every unit on this list, as long as you follow the instructions and treat your machine right, it will reply in kind.